(Reuters) - Facebook has acquired hundreds of patents from International Business Machines Corp as the social networking company attempts to bolster its intellectual property portfolio in the wake of a lawsuit filed by Yahoo. The 750 patents from IBM cover a broad range of technology, ranging from search to semiconductors, according to a person familiar with the matter. 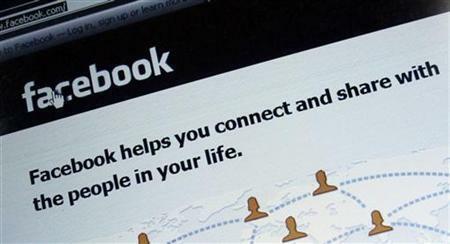 A Facebook spokeswoman said the company had no comment, and an IBM representative could not immediately be reached. Yahoo sued Facebook earlier this month, claiming that Facebook infringed 10 patents, including several that cover online advertising technology. A classic defense for companies targeted with patent claims is to threaten a countersuit using its own patents. But Yahoo possesses far more patents than Facebook. Before the IBM transaction, Yahoo had over 3,300 patents and published patent applications, according to a U.S. government database. Facebook had 56 issued patents and 503 applications as of December 31, the company said in a recent filing with the U.S. Securities and Exchange Commission. An illustration picture shows the log-on screen for the website Facebook, in Munich February 2, 2012. Facebook, the world's largest Internet social networking service, is preparing for an initial public offering that could value the company at up to $100 billion. It is unclear how much Facebook paid for the IBM patents, but tech companies seeking to build their portfolios have pushed intellectual property prices higher. Google agreed to buy Motorola Mobility last summer for $12.5 billion, and said Motorola's patents were a prime attraction. That deal came after Nortel Networks Corp sold about 6,000 patents to an Apple Inc-led consortium for $4.5 billion, after Google bowed out of the bidding. IBM's transaction with Facebook was first reported by Bloomberg.